Rule 3 applies mainly to three-way races. When only two candidates are trying to fill a seat, money, activism, and positioning close to the local center win the race. In a conservative district it is possible for a Constitution or right-leaning Libertarian Party candidate to beat a Republican in a head-to-head contest. In a liberal district it is possible for an unreconstructed Green Party candidate to beat a Democrat. To do so still requires some concessions to moderation. It still requires organization, money, and a credible candidate. But it is possible. The lesser of two evils dilemma does not apply. You get the votes of those who like your candidate. The press either covers your candidate or has no race to cover. Here’s the unspoken fact of American politics: we do not have a two-party system; we have a 1.5-party system! State legislatures gerrymander the districts. A Democratic legislature will try to cram the conservatives into a small number of ultraconservative districts. A Republican legislature will try to cram the liberals into a small number of ultraliberal districts. For this reason the Republicans supported minority dominated districts – until they were chided for their ideological inconsistency. Such lopsided districts create opportunities for third parties. I did a study of a dozen states back in 2001. I found that of the states I sampled, most had at least 1/3 of their lower state house races uncontested by the major parties. Libertarians who ran in these districts fared four times better on average than those who ran in three-way races. Factors of four are significant. I suspect the same would hold for other third parties, but I didn’t tally such at the time. A focus on state and local issues. While U.S. Congressional districts are gerrymandered, they are nearly always contested by the major parties. Unless your third party can outspend one of the two candidates, you will be clobbered by the lesser of two evils dilemma. A willingness to drop out of three-way races. If your party is conservative, drop out if your candidacy would cause a liberal Democrat to beat a [semi-] conservative Republican. Playing the spoiler will only irritate a large portion of your base. If your party is liberal, drop out if your candidate would cause a Republican to win. Anticipation of which districts will be uncontested. Districts shift. Focus your recruitment on areas which are liable to stay within lopsided districts. Recruit heavily after redistricting. Ease up on recruitment and focus on winning where strong during the end of the ten year cycle. Staying away from running serious presidential campaigns. This is a corollary of the first three bullets. 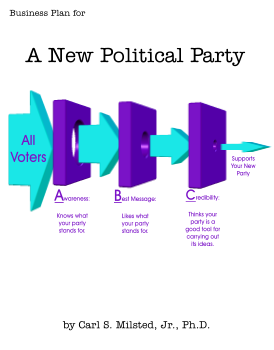 Presidential campaigns should be for party branding only. These strategies could be productively applied by the existing minor parties. They are also useful for a new party just getting off the ground. Even with triangulation, a new party will suffer lesser-of-two-evils dilemma for all but its deepest core base until it can build up its resources to the point that it has a chance of winning.